Mary Jo Wall (second from left) accepts a check from Julia Hidy of the proceeds from the 2017 “Come Grow With Us” project. This project is sponsored by St. Andrew’s Episcopal Church and Good Shepherd Lutheran Church and will help St. Vincent de Paul at St. Colman of Cloyne Catholic Church. Pictured with Wall and Hidy are Shannon Jacobs, Claudia Coe, Doug Hosch and Charles Woodard. Good Shepherd Lutheran Church and St. Andrew’s Episcopal Church in Washington Court House recently harvested 10 acres of soybeans to help support outreach programs. During the summer of 2017, a project named “Come Grow With Us” was undertaken to raise soybeans and use the profits to fund two outreach programs: The Well at Sunnyside and St. Vincent de Paul Society – St. Colman Conference. This year’s “Come Grow With Us” project was located east of Washington Court House at the intersection of Route 22 and the 753 extension road. The use of land was donated by Dean O’Connor and Gary Nicholson. Other sponsors were Crop Production Services, Gibbs Insurance Associates, Seed Consultants and Cargill. James Jacobs and Wayne Hidy, members of St. Andrew’s, provided all the field work and expertise to make this year’s project a success. 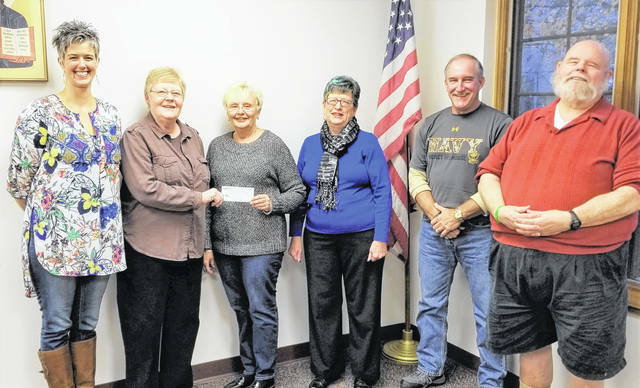 https://www.recordherald.com/wp-content/uploads/sites/27/2017/12/web1_ChurchesGrowSoybeans.jpgMary Jo Wall (second from left) accepts a check from Julia Hidy of the proceeds from the 2017 “Come Grow With Us” project. This project is sponsored by St. Andrew’s Episcopal Church and Good Shepherd Lutheran Church and will help St. Vincent de Paul at St. Colman of Cloyne Catholic Church. Pictured with Wall and Hidy are Shannon Jacobs, Claudia Coe, Doug Hosch and Charles Woodard.